Ukrainian carrier Dniproavia has transferred almost all of its Embraer 145 aircraft to Windrose Airlines. The move is believed to be linked to the operator’s planned nationalization. According to the fresh edition of the Ukrainian civil aircraft registry, published on the State Aviation Administration website on June 15, Windrose has received three aircraft formerly operated by Dniproavia since the registry was last updated in May. These are an EMB145EP (UR-DNG, built in 2001, owned by Cypriot company Dilorsano Consulting), an EMB145LR (UR-DNR, built in 2002), and an EMB145LR (UR-DNT, built in 2003). The latter two are owned by Portuguese lessor Goiania Comercio E Servicos Internacionais. Windrose is also understood to have received two ex-Dniproavia EMB145EUs that were no longer listed under the previous operator’s name back in May. The two airframes, UR-DNB (built in 1998) and UR-DNF (built in 2001), are on lease from Goiania. As of June 15, Dniproavia had only two aircraft left in its fleet, one EMB145EP (UR-DNP, built in 2000) and an EMB145LR (UR-DPB, built in 2000). Both are owned by Dilorsano Consulting. The transfer is suspected to be linked to the airline’s possible nationalization. The two operators, as well as the country’s flag carrier Ukraine International Airlines, are believed to be controlled by the Ukrainian oligarch Ihor Kolomoisky. By moving the aircraft from one carrier to the other Kolomoisky could mitigate the risk of losing control over his assets in a nationalized Dniproavia. 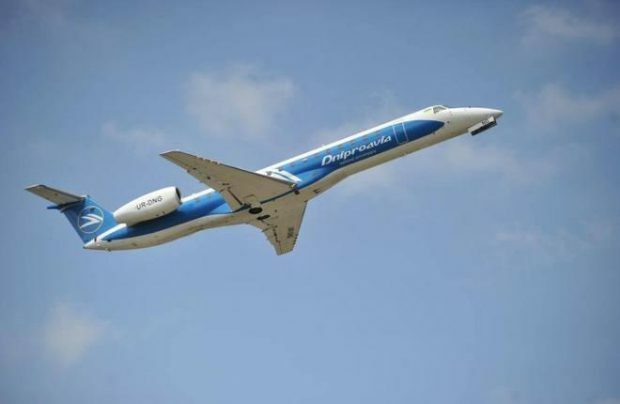 The nationalization topic first emerged this spring, when the Commercial Court of Dnipropetrovsk Region ruled on a lawsuit filed by the State Property Fund that Dniproavia should be returned to state ownership. The explanation offered was that Dnipro-based company Galtera, which had purchased 94.572% in the airline from the state back in 2009, had failed to deliver on its investment commitments. The lawsuit is currently at the appellate and cassation instances.